I suppose there are people who believe imagination isn’t essential. People who think the visible realm is the important one, facts are what matter, not theories or dreams. I’m not among those people. I believe imagination is important. I’d even go so far as to say imagination is vital to our well-being as humans and as Christians. Imagination helps us empathize with others. Romans 12:15 tell us to “rejoice with those who rejoice and weep with those who weep.” Then of course there’s the Golden Rule in Matthew 7:12: “treat people how you want them to treat you.” Have you ever considered how difficult this would be if you had no imagination? How can we weep with the brokenhearted if our hearts don’t break a little with them? How can we truly rejoice with the joyful if we don’t feel some of their happiness as if it were our own? Imagination is the bridge that takes us from the world we live in, the world that has “me” at center, to the world of others’ hopes and tears and joys. It broadens our feelings, our views and our ideas. It forces us to treat others not as something separate, but as a part of ourselves. Which is exactly as God intended, isn’t it? Imagination helps us picture the future, and prepare for it. Pretty straightforward, right? You have to imagine what your future will be like, sometimes tomorrow or next week, sometimes in a year or ten years. It doesn’t matter if you’re grocery shopping for the week, or budgeting for the month, or planning a marriage, or raising a child … you have to picture the future in order to make smart choices now. Say what you will, that takes imagination. Imagination helps us know God better. Imagination is at the heart of God, really. As the Creator of the universe, imagination was crucial to Him. His very nature is a creative one. And when we feel His nature speak through us in the form of our imaginations, we know Him better. Yes, our attempts at creating things are pathetic and second-rate compared to His. But they bring us closer to Him, still; they forge a strong link between ours hearts and His. We are like children emulating our Dad, and finding joy in it. When I create things I understand my own inadequacy, but in the light of my Father’s greatness, that doesn’t seem to matter … I just find joy in the act of creating, and in my creations, however flawed. Like He does. Try for a second to stop thinking about what will happen to you in a minute – an hour – a day – a week – a year – a lifetime. The dreams you have always had? Nowhere to be seen. The hope you have for a husband and family of your own? Gone. Becoming a stronger Christian tomorrow than you were yesterday? Don’t even think about it. In fact, you can’t think about it … because you have no imagination … remember? My efforts for myself and my family and my son and my career would flag and die if I couldn’t conjure an image of a hopeful future. Why discipline or love my son if I can’t picture his future as a man after God’s own heart? Why live a life for God at all if I can’t imagine the hope of heaven, if I can’t picture being there myself? Imagination makes us stronger Christians. I don’t know about you, but I’m not certain I’d be a Christian if I didn’t have an imagination. It always seemed to me that you could take every fact in the world to prove something – Christianity included – but in the end it still comes down to a matter of leaping. A matter of faith. Yes, the facts are lined up for me. Yes, the evidence of God’s works are before me. His Word is written on the pages beneath my fingers. … But perhaps my heart is wary still. What will such a leap mean for me? When I believe, what will be required of me? I imagine looking into the face of God, for that’s what such a leap will mean, surely … I can imagine being in His presence, accepting Him not as a fact, but as all-consuming, beyond facts, Alpha and Omega, Creator of the world and of my soul. So the leap must be made. 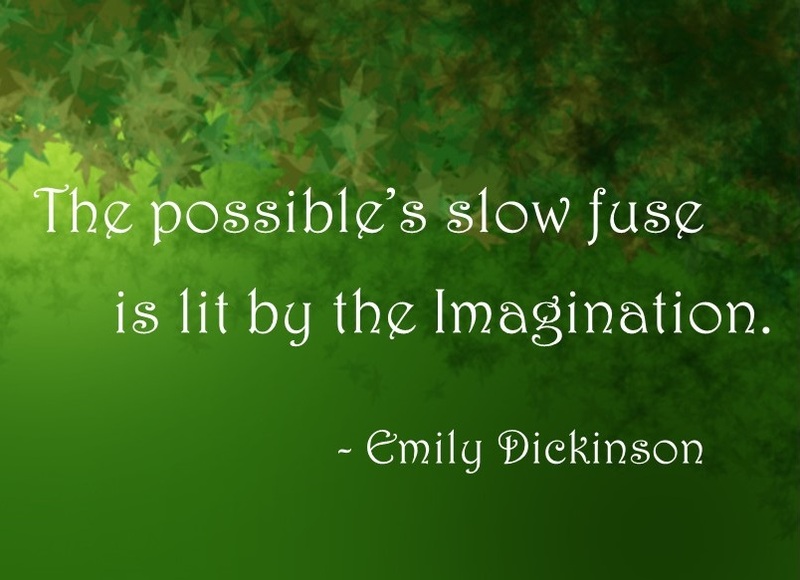 And to make it, imagination is vital. And what do I imagine? Arms that hold me, a voice that whispers truths unseen. I see God’s face in my imagination. And not only do I have to believe He is God … I want to believe. Some of the most important things in life have a basis in imagination. Foresight. Hope. Wisdom. Faith. Even love. Can you picture life without even one of these things? No? Then you are like the rest of us. You are like me. You have an imagination. Personally, I think it’s one of God’s greatest gifts. Next postFun News for Reviewers of The Word Changers! Wonderful post on the importance of imagination. Dare I go a step further and say that reality itself may be rooted in imagination? I love this because it puts imagination at the heart of other-centeredness, of love. This means that if love truly is the constituting force that binds all things together, then imagination is much more than we have thought. He who lacks imagination may live no life at all. Henry Miller said “Imagination is the voice of daring.” It may also be the voice of being. What great points! I’ve always known you need it for writing, but you opened my eyes to how we need it as Christians and as humans. When you talked about imagination being the heart of God, it reminded me of Tolkien. He called humans “subcreators”, since we are mimicking God whenever we create and, yes, imagine. That’s part of why humans are so special, as opposed to all other creatures. We are made in God’s image and so can create new things. Thanks for sharing! Thanks so much, I’m glad you enjoyed! What book does Tolkien talk about subcreators in? I’d like to read it! It’s actually an essay titled “On Fairy-Stories”. It’s really good, I highly reccomend it!